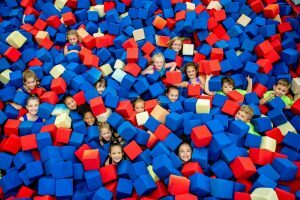 Parents’ Night Out is our monthly open gym free play opportunity for children 3 to 13 years old. PNO is held from 6:30 to 9:30 p.m. on one Friday night each month. Our staff will supervise the kids through scheduled activities and serve them a snack and juice. Children 3 and 4 years old will be in the Little Gym, and children 5 to 13 years old will be in the Big Gym. Non-members are welcome at PNO, so bring a friend for double the fun! Cost is $25 plus tax per child.